The diagram below is less complicated to operate than it looks. The electric pump draws the water from one of three main tanks in the salon, or, via a 3 way valve, directly from the watermaker day tank. 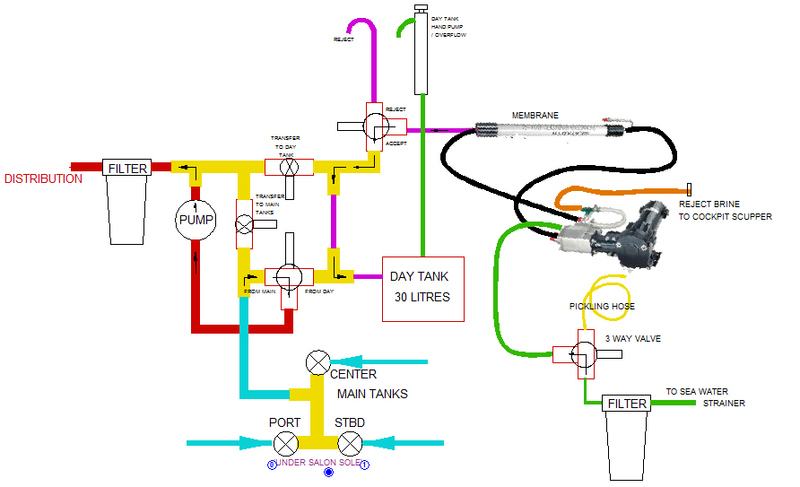 The pump can be used to transfer water from the day tank to the main tank or vice versa using the 3 way valve and one of the other two transfer valves. For the first few minutes, the reject product water from the watermaker goes to a spigot in the galley sink where it can be tested. Once the water is tested OK, the three way, reject valve is switched to allow the water to go to the 30L bladder, day tank. When the day tank is full, it overflows through the hand pump in the galley sink. The hand pump can also be used to draw water from the day tank, or it could be transferred to the main tanks.